canoeing, jet-skiing, diving and paragliding, plus cavern diving, which uses technical equipment to explore the deep and dark caverns. For those who love travelling on the water, the Mavi Yolculuk (Blue Voyage) tours, and other excursions on boats, can be madeto the surrounding islands. Habesos is the earliest known name of the ancient city, as proved from archaeological findings. But the name Antiphellos is far more familiar, and this was the harbour of ancient Phellos. Excavations here have revealed a settlement dating back to the 4th century BC, possibly earlier, although it reached its height of importance during the Roman and Byzantine periods, when it was a centre for Bishops. It had also been significant in the world of sea-faring commerce, and during the Roman era wasespecially famous for its exported sponges. It was attacked by Arabs, then added to the territory of the Anatolian Seljuks, and took the name Andifli. After the destruction of the Anatolian Seljuk state, the Ottomans added it to its lands. The name Kas means ‘eyebrow’, or ‘something curved’,describing the shape of the town under the backdrop of 500m high cliffs behind. Summers are hot and dry in Kas, quite typical of Mediterranean region, and the temperature can reach around 35 degrees during the day. Winters are warm during the day although can get cool at night, and can drop below 10 degrees. Situated along a particularly scenic stretch of the Turquoise Coast, the charming towns of Kas and Kalkan have in recent years become two of Turkey's most favoured resorts amongst discerning travellers, thanks to their splendid coastal locations, their attractive architecture, their comprehensive facilities and - above all - their unique ambience. Once a humble sponge-fishing village, Kalkan has in recent years been transformed into quite a sophisticated resort, and it is not hard to see why many visitors have been so enchanted by this lovely spot that they return year after year (in fact, many have actually bought summer homes in order to be able to spend as much time here as possible). Kalkan's setting - clinging to steep hillsides that enclose an almost perfect, circular bay - is simply magical, and the old village centre with its handsome old houses lining quaint, cobbled lanes is immensely picturesque. Luckily, Kalkan's increasing popularity has not destroyed the unique, old-world charm that put the village on the map in the first place. The locals are aware that if they want to retain their rather upmarket clientele, they need to preserve the village's special character. As a result, Kalkan has a certain air of exclusivity, and visitors here are rewarded with a selection of restaurants that ranges from the simple to the sophisticated, an assemblage of shops selling all manner of arts and crafts, and most importantly an ambience that is hard to find anywhere else on the shores of the Eastern Mediterranean. Much of the seafront is taken up by the pretty fishing harbour, from where boats ferry guests to the swimming platforms built into the rocky coastline along the bay, but there is also a manmade pebble beach at the eastern end of the village centre. Those who prefer sandy beaches can travel by car or dolmus either east to the small cove of Kaputas at the base of the eponymous gorge, or west to the seemingly endless beach of Patara, which backs onto an important archaeological site. Numerous other sites of historical interest are also easily reached from here, making Kalkan as suited to keen explorers as it is to those who simply like to relax and potter around in scenic and charming surroundings. 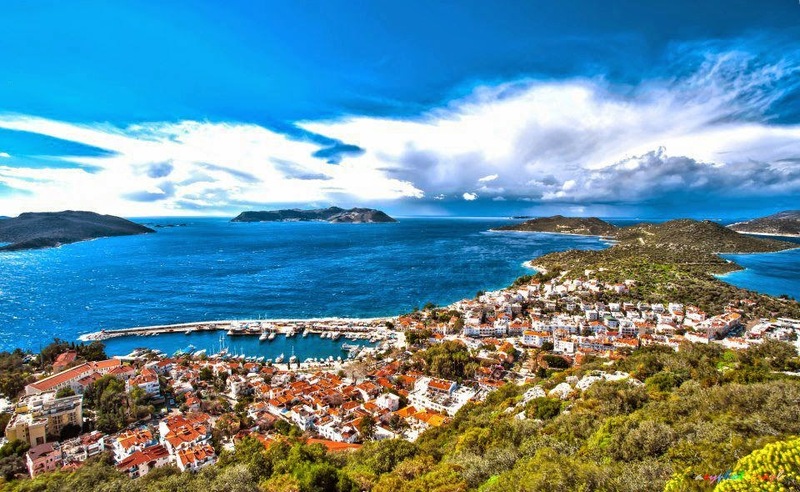 A 30-minute drive east along the coast takes you to Kas. Built on the site of ancient Antiphellos - a major sponge fishing centre and busy trading port in Hellenistic times - Kas today is a bustling town that nevertheless retains an authentically Turkish atmosphere. Kas looks out across the sea to Kastellorizo, the easternmost of the Greek islands, and was in fact itself once Greek-populated, a fact reflected in the architecture of some of the town's grander buildings. Whilst not quite as quaint and picture-postcard pretty as neighbouring Kalkan, Kas charms visitors with a generous dose of local colour, for tourism and local life exist side by side here, never more so than during the weekly street market held every Friday, when holidaymakers searching for handicraft and souvenirs mingle with housewives shopping for fresh produce and checking the household goods stalls for a bargain. Whilst the market is a colourful event that no visitor should miss, Kas also offers excellent shopping the rest of the week, and a leisurely stroll through the town reveals many hidden delights, such as the picturesque street 'Uzuncarsi Caddesi', with its wooden balconies and flower-framed doorways leading up to a 3,000-year old sarcophagus. Other remnants of days gone by that can be found simply by pottering around Kas include a small but almost perfectly intact Hellenistic theatre - a popular spot for wrestling matches or simply to sit and watch the sunset. To the south west of the town is the rugged Cukurbag peninsula, a long, slender finger of land that encloses a deep, fjord-like bay. Home to a number of small, well- designed hotels, the peninsula is where most of the town's more discerning visitors opt to stay, thus enjoying easy access to the attractions of the town centre, whilst being far enough from the hustle and bustle to be able to relax in complete peace. After a few days unwinding, most guests will want to explore some of the cultural treasures of Central Lycia, and Kas makes an ideal base for doing so, especially if you decide to hire a car for part of your stay. However, the most romantically situated antiquities in the area can easily be visited without a car, as the magical sunken city of Kekova is best seen from one of the boat trips that leave regularly from the harbour in Kas.